Part of my Masters Thesis. A key part of changing the use of a building is deciding how much alteration to the building fabric is necessary; I needed to find the most appropriate way of developing a series of private and public spaces that allowed integration but also the security needed in a multi-use building. I became interested in the work of Herman Hertzberger, a Dutch architect who wrote extensively on thresholds and community architecture. One of his fascinations was the implied thresholds, ie using geometries and furniture to imply a separation of spaces without physically using walls. This allows people to take ownership of shared space. The conversion of St Johns was designed in a way that it could develop over time, the architectural changes being instigated as the financial resources grew. 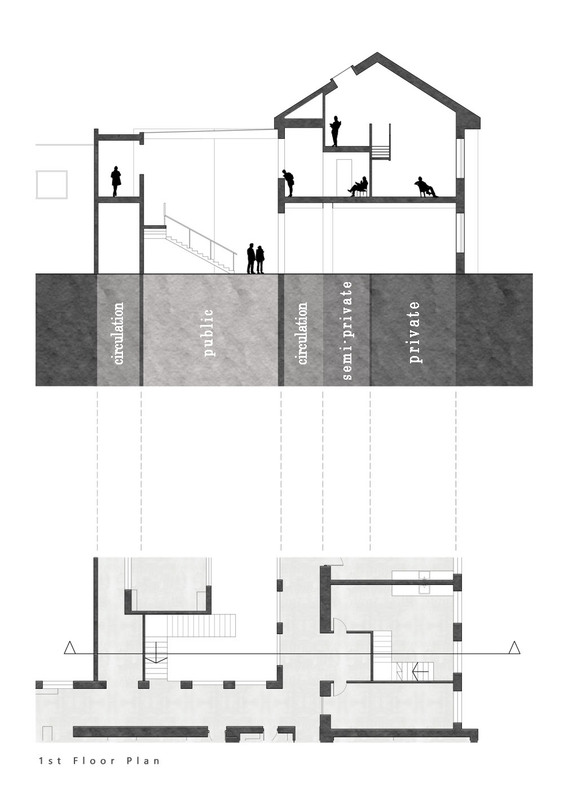 These diagrams explore the separation of spaces in different scenarios depending on the stage of investment in the project.